Can I try the HDS1504 for Symbol Motorola CS-1504 scanners Ver 4.0.1 software before purchasing a license? Where can I purchase a HDS1504 for Symbol Motorola CS-1504 scanners Ver 4.0.1 license and obtain a registration key? What Computing Platforms are Supported by HDS1504 for Symbol Motorola CS-1504 scanners Ver 4.0.1? What kind of HDS1504 for Symbol Motorola CS-1504 scanners Ver 4.0.1 licenses are available? What are the differences among available HDS1504 for Symbol Motorola CS-1504 scanners Ver 4.0.1 licenses? If I buy a HDS1504 for Symbol Motorola CS-1504 scanners Ver 4.0.1 license, can I use HDS1504 for Symbol Motorola CS-1504 scanners Ver 4.0.1 on more than one computer? What is a 'Product Serial Number'? How can I find the 'Product Serial Number'? What is a 'registration key'? What if I provide the wrong 'Product Serial Number' and receive a 'registration key' that doesn't work on my computer? Where can I find HDS1504 for Symbol Motorola CS-1504 scanners Ver 4.0.1 help? What is the HDS1504 for Symbol Motorola CS-1504 scanners Ver 4.0.1 support email? Yes. Installing the software automatically entitles you to a free 40-day trial period. You can download the free trial version of HDS1504 for Symbol Motorola CS-1504 scanners Ver 4.0.1 here. Please visit the HDS1504 for Symbol Motorola CS-1504 scanners Ver 4.0.1 license and registration page. Currently, IBM-PC compatible systems running Windows 2000, XP, Vista and Windows 7. Please visit the HDS1504 for Symbol Motorola CS-1504 scanners Ver 4.0.1 license page. Install a 40-day evaluation license of HDS1504 for Symbol Motorola CS-1504 scanners Ver 4.0.1 free of charge. We encourage you to try out HDS1504 for Symbol Motorola CS-1504 scanners Ver 4.0.1 with a free evaluation license first. A single user license can only be used on one computer at a time. Uses 'Product Serial Number' technology for copy protection and requires a separate license for each copy of HDS1504 for Symbol Motorola CS-1504 scanners Ver 4.0.1. 'Site License' allows the customer to install a single program on an unlimited number of computers at a single site (company building). After purchase, customer receives ‘special build’ version that doesn't require entering ‘registration keys’. It has a hard coded ‘registered to’ value and must be registered to a company. For 10 or more users, you may want to consider Site License or Unlimited Site License. 'Unlimited Site License' allows the customer to install a single program on an unlimited number of computers at any company location worldwide. A single license can only be used on one computer at a time. If you need more than one registered copy of HDS1504 for Symbol Motorola CS-1504 scanners Ver 4.0.1, then you will need to purchase the corresponding number of licenses. If you are going to purchase two or more licenses at the same time, you qualify for additional discounts. For 10 or more users at a single site, you may want to consider a site license. The 'Product Serial Number' is an hexadecimal code HDS1504 for Symbol Motorola CS-1504 scanners Ver 4.0.1 uses to uniquely identify a computer on which HDS1504 for Symbol Motorola CS-1504 scanners Ver 4.0.1 is installed. This prevents the software from being run on more than one machine, so you will now need additional keys for additional computers. You will be required to provide the unique 'Product Serial Number' for licensing and registration. 'Product Serial Number' is displayed on the terminal window when you run the software and in the registration dialog. Some hardware upgrades may change 'Product Serial Number' and under these circumstances you will need a replacement key (no aditional fee is required). You may click on button labeled 'Copy' to copy 'Product Serial Number' to system clipboard. Then you can simply paste the 'Product Serial Number' into the appropriate field at the HDS1504 for Symbol Motorola CS-1504 scanners Ver 4.0.1 registration site. Pasting the 'Product Serial Number' into the appropriate field (vs. typing it in directly) helps minimize the chances of providing an incorrect 'Product Serial Number'. The 'registration key' is a generated character code provided to you via email once you purchase a license and provide the unique 'Product Serial Number' generated by HDS1504 for Symbol Motorola CS-1504 scanners Ver 4.0.1. You must enter the 'registration key' in HDS1504 for Symbol Motorola CS-1504 scanners Ver 4.0.1 'registration screen' to complete registration and unlock the 'Full' version of HDS1504 for Symbol Motorola CS-1504 scanners Ver 4.0.1 for use on your computer. If you do provide the incorrect 'Product Serial Number', the 'registration key' provided to you will not work. If you find your 'registration key' does not work, contact us via email to provide the correct 'Product Serial Number'. New version of HDS1504 for Symbol Motorola CS-1504 scanners Ver 4.0.1 allows you to copy the 'Product Serial Number' to the clipboard by clicking on a button labeled 'Copy'. 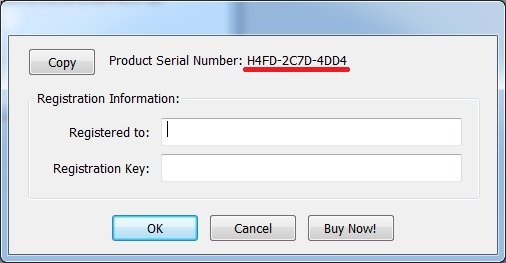 You can simply paste the 'Product Serial Number' into the appropriate field at the HDS1504 for Symbol Motorola CS-1504 scanners Ver 4.0.1 license and registration site. Pasting the Product Serial Number into the appropriate field (vs. typing it in directly) helps minimize the chances of providing an incorrect 'Product Serial Number'.